BUCKFIELD — A 24-year-old man died Wednesday night when his Volkswagen Beetle crossed the centerline and collided head-on with a Ford F-150 hauling a trailer on Route 117, police said. 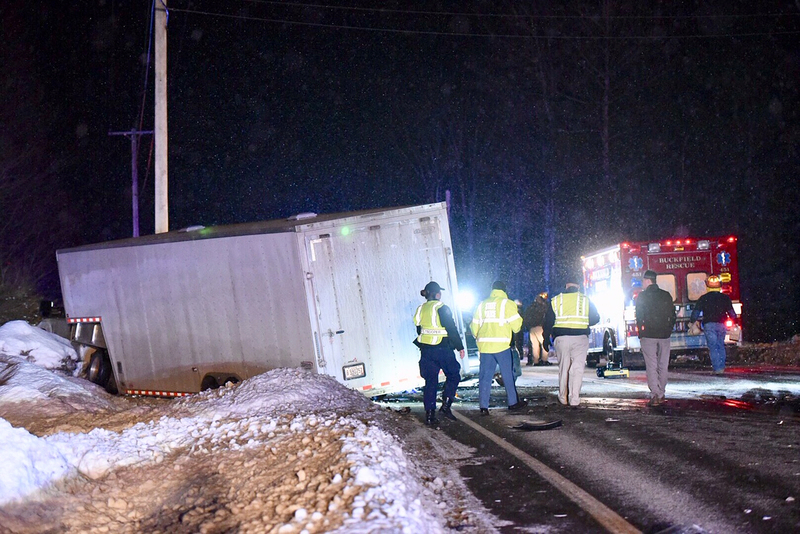 A 55-year-old woman driving the truck was taken to the hospital as a precaution for injuries that were not life-threatening, Maine Department of Public Safety spokesman Stephen McCausland said in a news release late Wednesday. The names of the drivers were to be released Thursday, McCausland said. Route 117 from the intersection of North Hill Road to the intersection of Roundabout Road and Bryant Road was closed to traffic for 5½ hours as police investigated. The crash was reported at 5 p.m. It occurred near the intersection of Cross Road, just beyond a concrete bridge that crosses the Nezinscot River traveling west. Debris from the scene was scattered about 20 feet from the crash site, where the Volkswagen and the truck were off the road, with airbags deployed. Cross Road is a dirt road that leads to the municipal ball fields and playground.